The plant is owned by Southern California Edison. Edison International, parent of SCE, holds 78.2% ownership in the plant; San Diego Gas & Electric Company, 20%; and the City of Riverside Utilities Department, 1.8%. When fully functional, it employed over 2,200 people. Located between the ocean and Interstate 5, the station is a prominent landmark because of its twin hemispherical containment buildings, which were designed to contain any unexpected releases of radioactive material from the power generators. 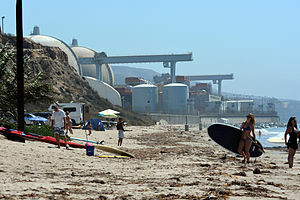 On June 22, 1980, in the wake of the Three Mile Island accident, about 15,000 people attended a protest rally against the San Onofre nuclear plant that was organized by the Southern California Alliance For Survival. Among the speakers was physicist Michio Kaku, who noted that one of the reactor pressure vessels had been installed backwards and called on California governor Jerry Brown (then considered an environmentalist) to shut them down.